Athena arrived in France after obtaining a Master's Degree in Obtained Arts in Iran. She went on to Arts and the Science of Art at the Panthéon University Sorbonne and obtained a Doctorate in Fine Art. Despite the demands of her studies during that time, Athena continued to sculpt. 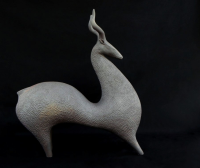 "The animal sculptures of Athena Jahantigh, who has resided in France since 2003, transport us back to an immense iconographic heritage, creating an inspirational and nostalgic bond with her native Iran, and marries to perfection her other great creative source of rock painting. The results are these little marvels of hieratic and callipygous animals with strong and sensual forms and a particularly modern sculptural presence.